The Atco Clipper 20 is fitted with a recoil start Briggs & Stratton 4-stroke engines has power drive and a centrifugal clutch with variable forward speed controlled by the engine throttle. Features include a cutting height of 7mm-30mm and front & rear rollers. Suitable for a lawn-size up to 50m x 50m. For the finest of lawns you need the finest of mowers and nothing beats the finish achieved by a traditional cylinder mower. There are three outstanding models in this sector of the Atco range: Clipper 16 Clipper 20 and Clipper 20 Club. 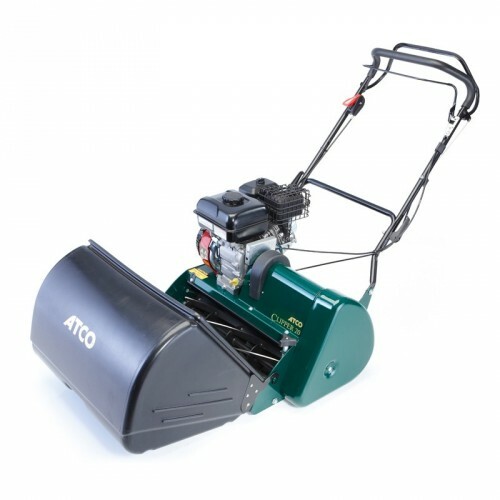 The Atco Clipper 20 is fitted with a recoil start Briggs & Stratton 4-stroke engines has power drive and a centrifugal clutch with variable forward speed controlled by the engine throttle. At the heart of this machine is the cutting cylinder. Our Clipper 20 has a cylinder with 6 steel blades which produce almost 340 cuts per metre. A single control point allows infinitely variable adjustment within a cutting height range of 7mm-30mm. A manicured lawn really needs classic stripes to show it off to perfection. Steel front and rear rollers fitted to Clipper mowers provide those stripes with no addition effort. Atco cylinder mowers combine advanced lawn mowing technology component durability and outstanding performance to deliver a finish truly deserving of our maxim - the finest cut of all.